A personal workout plan designed with your lifestyle in mind will help you reach your fitness goals. Everyone has a different fitness goal. Some simply want to lose weight. Others have a more specific target: Lose 40 pounds, get off blood pressure medication or be active enough to keep up with their children. Every goal needs a plan of attack, and that’s why Gold’s Gym provides a complimentary Fitness Profile, which includes a 30-Day Personal Workout Plan. By creating a personal workout plan, our experts will help you find your starting point to reach those goals. “It’s literally a plan you can take with you,” says Austin Johnson, an expert with Gold’s Gym’s Fitness Academy. “You can wake up every morning and know exactly what kind of workout you’re doing that day. “The idea is to stay engaged with you in those 30 days to help you stick to working out so you’ll see results,” he says. In order to design the most effective plan for each person, there are a few things we need to know. Gold’s Gym member Chloe Campos says she’s been on a weight loss journey for as long as she can remember. 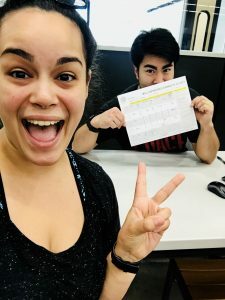 In her Fitness Profile consultation, Campos shared her long-term goal with Gold’s Gym Fitness Manager Vassar Louie-Bradford. But it’s the steps in the 30-Day Plan that have her the most motivated. Even if you haven’t worked out in a long time — or ever — your goals are achievable. The 30-Day Plan will help you get started. If a person at that true beginner fitness level has a goal to lose 40 or 50 pounds, their personal workout plan will be a progression to get them on track rather than one to get them to that specific target in 30 days, Johnson says. With all of the information gathered so far, our experts will recommend a program they think will best serve you. It may include personal training, group exercise classes or GOLD’S AMP™, our digital coaching app. “Vassar did a great job of asking how my daily schedule looks when I’m not in the gym,” Campos says. “This is super important because we were able to customize the plan to accommodate my schedule. When you receive your personal workout plan, you will also schedule a follow-up appointment at the end of the 30 days. At your follow-up, you and a Gold’s Gym professional will review your program. You may have found you prefer certain types of workouts and want to include them more, or that you want to focus on a different short-term goal. “I’ve learned that I really enjoy group settings. That’s why I love GOLD’S STUDIO® classes,” Campos says.